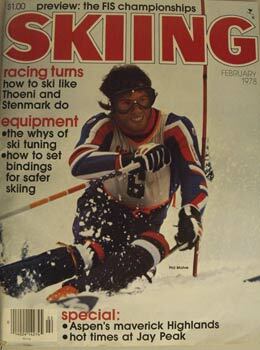 Originally published in May/June 2003 issue of SKI Magazine. As the quad chair cleared the loading ramp and accelerated to 2,800 feet per minute, the fellow sitting next to me said, "Look at all those oddballs on those funny short skis and snowboards down there. Skiing sure wasn&apos;t like this in the good old days." His comment started me thinking. Just how good were the good old days? Warren Miller in the "Good Old Days." Most of the things we take for granted today had not been invented when Ward Baker and I spent the winter of 1946-47 living in the Sun Valley parking lot. The good thing about living there for three and a half months in an 8-foot trailer was that we skied every day for 18 cents a day. But I get ahead of myself. Safety bindings? No way. When you fell, your skis stayed on—and your leg sometimes fell off. Or at least it revolved, independently of your torso. Plastic ski boots? Didn&apos;t exist. We wore soft leather boots that reached our anklebones. Today those boots wouldn&apos;t even be considered enough support for cross-country skiing. Metal or fiberglass skis? No such thing. Everyone skied on stiff hickory boards that were so long they reached to your hand held high above your head. Unless your skis were 7 feet long, you were considered a wimp. Thermal long underwear? Nope. Our long johns were made of wool, and when they got wet they itched so badly you could hardly sit still on the chairlift. Grooming? Forget that. Racers sidestepped down a slalom or downhill course to pack and smooth it the day before a race. Otherwise, you skied the snow in whatever condition you found it in. The moguls just got bigger until a snowstorm filled them in. High-speed lifts? Most resorts only had one single chairlift. It carried about 400 people an hour, and on most weekends the line was more than 45 minutes long. Rent a condo? Not invented yet. The lodges in Sun Valley slept 846 in 1946. If you were good with tools, you remodeled the back seat of your car so you could sleep in it and cook your meals over a Coleman stove. Check your skis on your flight? No way! In 1952, the first few times I flew, they had to slide my skis under the three back seats of the DC-3. In the good old days you got to drive narrow, icy roads without snow tires, power brakes, power steering or four-wheel drive. In the good old days you got to stand in those 45-minute liftlines with itchy, wet long johns because your gabardine ski pants weren&apos;t waterproof. You got to feel the water seep in through the holes in your lace-up ski boots. You got to peer through foggy goggles as the ski patrol hauled another skier off the hill with a spiral fracture caused by bear-trap bindings. So give me skiing as it is today, on runs that were groomed to corduroy perfection the night before, riding up the mountain on high-speed quads, comfortable in layers of waterproof-breathable clothing, plastic boots with heaters, thermal socks and underwear that wicks away sweat, insulated gloves, fog-free goggles, releasable bindings tuned to my weight and ability, lightweight poles and soft-flexing fat skis to carve up yet another postcard-perfect slope. I started making turns in 1937 on a pair of $2 pine boards with leather toe straps. Since then, fortunately, the inventors of ski gear have kept ahead of my need for equipment that makes the sport easier on my body. For me every day is a good old day, and each day is better than the last. Warren Miller takes a trip down memory lane, remembering how the ski world is different and yet unchanged.